SCOTTSDALE, Ariz. – Jan. 30, 2016 – Barrett-Jackson, The World’s Greatest Collector Car Auctions®, has teamed up with IMI Design Studio, an upscale interior design boutique, and Phoenix artist, Angel Diaz to create the Green Room, worthy of hosting our featured entertainer during the Barrett-Jackson 45th Anniversary auction. Barrett-Jackson enlisted the help of Anita Lang, founder and principal designer at IMI Design Studio, a Scottsdale-based luxury interior design firm. Using Zac Brown Band as the inspiration for the design, Anita and her team created a raw, southern unassuming lounge. The room boasts an industrial edge that is masterfully mixed with pieces from the 1970s to create a unique vibe. Materials of rebar and cement block are mixed with saturated over-dyed rugs and vintage pieces. A focal point of the Barrett-Jackson Green Room is “Sagrado”, which consists of two 4 foot x 8 foot MDF Boards painted by Angel Diaz, a Phoenix-based artist. 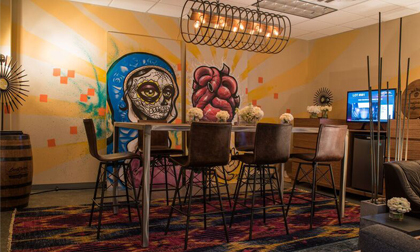 The graffiti-style mural was inspired by Zac Brown Band’s album cover, “Uncaged” and was painted by Diaz in the Green Room. Experience the 45th Anniversary Scottsdale Auction in style with a Barrett-Jackson VIP Experience Package. Information on available packages and how to be a part of this world-class lifestyle event is available here. IMI Design, LLC is an upscale, full-service interior design studio with offices in Scottsdale, AZ and Truckee, California. Founded in 1990 by Anita Lang, the firm specializes in pre-construction and pre-renovation design. In this approach, interior designers work with architects, builders and contractors to ensure that their clients’ interior spaces flow effortlessly with their homes’ and businesses’ architecture. IMI Design’s award winning projects have been featured in magazines and broadcast media outlets in the US and abroad. For complete information about IMI’s services and projects, please visit online at www.imidesignstudio.com or call 480-970-8979.